The Brandon University community is saddened to learn of Dr. M.V. 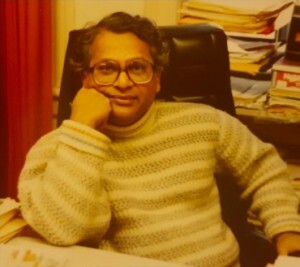 Naidu’s passing. A retiree and Professor Emeritus in Political Science, Dr. Naidu was a dedicated member of our faculty for 40 years from 1965 to 2005. He will also be remembered for his work in editing and publishing “Peace Research: The Canadian Journal of Peace and Conflict Studies” from 1984 until 2006. Longtime colleague Dr. Meir Serfaty says that Dr. Naidu’s influence was felt during the important transition from Brandon College to Brandon University in 1967. “He was very much a part of the expansion in programs and educational opportunities that took place during that exciting time of growth. As Head of the Department of Political Science, he modernized our curriculum and was responsible for introducing, and teaching, many of the courses that we still offer today,” Dr. Serfaty said. Dr. Naidu died Saturday, Feb. 27, 2016, at Concordia Hospital in Winnipeg. His spouse Prema sends her thanks to all the friends who touched their lives and enriched their experiences. Tomorrow, Brandon University will lower its flag to half-mast to honour Dr. Naidu and his contributions to the University. A service will be held on Saturday, March, 5, 2016, at 2 p.m. at Thomson in the Park Funeral Home and Cemetery in Winnipeg. Those who wish to make donations to the M.V. Naidu Award can send cheques, payable to the Brandon University Foundation, to 270-18th Street, Brandon MB, R7A 6A9. Donations may also be made online at brandonu.ca/give/donate or by telephone at 204.727.7374 or 1.877.BU.2.GIVE.